But Jamie looked to be pulling ahead of target, and Jef was going well next to me on target to finish before me still, so the pace had to keep going. A pb by about 22seconds, and a 1:46.1 average according to rowpro, or 1:46.0 according to the PM4. I pushed on hard in that final split in the hope of getting the average split under 1:46.0, but it just wasn’t to be. A pretty solid personal best over my last time set over 3 years ago, and a great start to the training year. Next stop, 10k. The day has arrived. The first 6 weeks of Pete Plan 2008 are complete and now we get to take the rewards from our hard work with a new personal best time over the half marathon – that’s the plan anyway. Due to the time difference between the athletes in the PP08 group, Shirley in New Zealand has already done her half marathon today. A huge personal best time by around 3mins, and only narrowly missing out on the world record by 6seconds! The WR wasn’t in the plan before, but the pacing was perfect hence getting so close. My half marathon has to wait until mid afternoon UK time as I will be joined on rowpro by Jamie in New York. 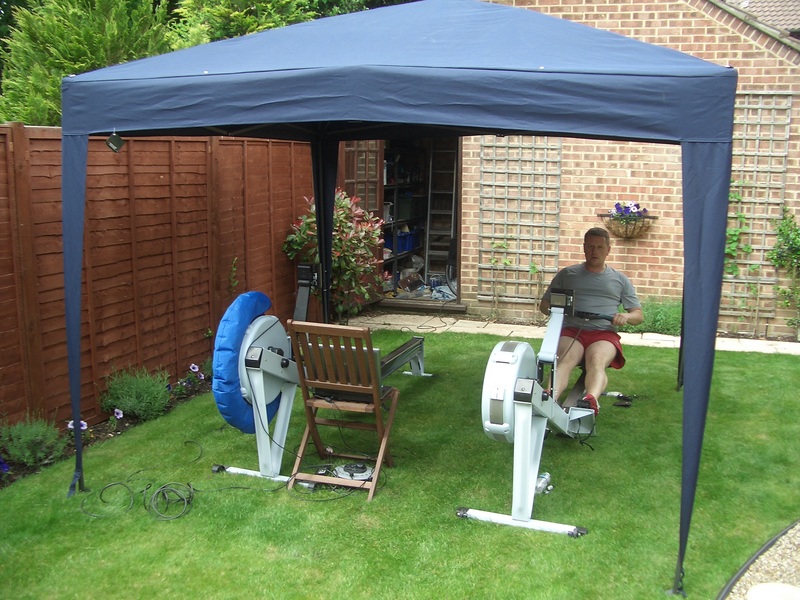 I will be rowing mine in the back garden – the weather is good, so no problems with set up. My personal best time of 74mins 58secs was set around 3 years ago – and at 1:46.6 average pace it’s not an easy one to beat. The training is done though, and I am in shape to beat it. The half marathon is a strange distance, much more mental strength than physical to reach your limit over this kind of distance. You have to be relentless is keeping the pressure on, and your concentration can’t break. You can’t afford to go much under target or physically you won’t last the distance. You can’t afford to go too much over target or you’ll not be able to catch up. So the plan is to row 1:46’s and 1:47’s from the start, and keep the average pace right on 1:46.5 throughout the first half. Stroke rate will start at 29 or so like the hour last week, and settle through the middle as I warm up fully to 27 or so, again as with the hour last week. This time though because I am going for the fastest pace I can possibly manage I will try to push on in the second half. Once you see 9999m left on a half marathon there is a big mental boost. I hope to negative split the second half, and average under 1:46 over the last 10k. 5 hours to start time, wish me luck. Wish the other athletes luck. Luck won’t come into it however. With the half marathon test coming up in just a few days time I am taking it quite easy on the training this week. I’m taking it even easier than the other athletes in the PP08 group as I felt like I had a slight cold below the surface, and didn’t want to risk it this week. WIth that in mind I took an extra rest day yesterday, and just did a steady 8k on rowpro this evening. I took this opportunity to record data on rowpro to review, including wearing my suunto heart rate chest belt (that comes free with a PM4 equipped model D). Just a very slight drift on the heart rate at the initial 1:52 steady pace, then step increases as the pace was increased over the last 2k. The slight drift of HR over the initial 6k could be caused by the slight decrease in stroke rate over the same time. Another thing to notice is the higher end HR on split 10 from the first document – this was caused by me thinking about when and how much to increase pace by to see the heart rate response. Just thinking about this caused the HR to jump 3 or 4 beats, and then it returned when I stopped thinking about this. This shows how factors other than actual physical effort affect your HR. 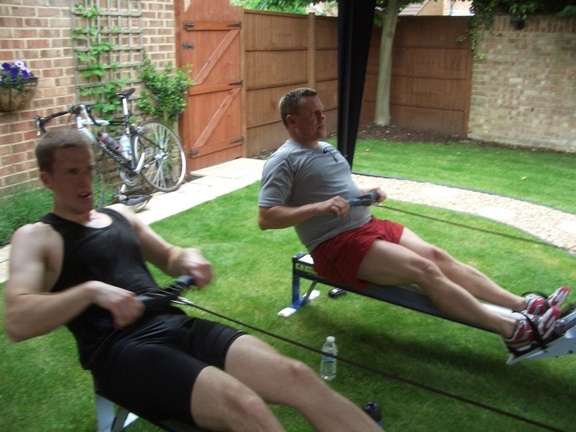 Try it, row a steady aerobic piece with your HR monitor on, and once your HR is stabilised after 3 or 4k, start thinking about your next 2k test, and visualise rowing that test – I bet your HR jumps significantly. Is the pace actually any harder or less sustainable? One more session planned tomorrow, then a rest day on Friday, then it’s half marathon day, the focus of the past 6 weeks of training. 1:46.5 average pace or bust – a personal best or nothing. The hard work is done, just 75 minutes of effort between me and the zero. Every athletes has their strengths and weaknesses, and the trick is knowing what each is, and making it work to your advantage. I believe this is the case is others areas of your life too. When I was younger I thought I had a weakness when it came to public speaking. I thought nerves made it very difficult to even contemplate getting up in front of a group of people and speaking to them. My heart rate would rise rapidly and my mouth would become very dry just at the thought of it. Later I realised that this wasn’t nerves, or at least not solely nerves. It was a flood of adrenelin into my blood stream. At school I would get the same feeling as the public speaking “nerves” if a difficult question was asked in class and I knew the answer, the heart rate rise and dry mouth. There is obviously a fine line between nerves and the “excitement” causing the adrenelin spike. 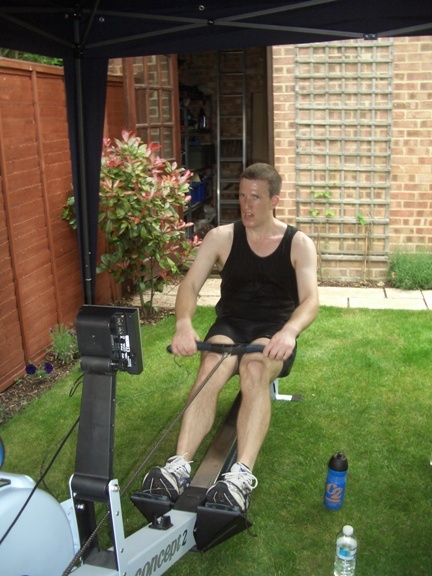 Why is this relevant to a blog about training and racing on a rowing machine? Simple, I experience the same physical response to racing on the erg, and sometimes towards the end of a personal best attempt when I know I’m going to get a great time. Knowing this “weakness” and when it occurs I can turn it around to become a strength, both on the erg and in other situations. On the erg this adrenelin spike can have a very negative effect, draining you of energy before a big race or time trial. It has to be controlled to become a strength, and released at the right time. When ROW appears on the monitor at the beginning of a race and the effortless 1:20 splits come out for a few strokes, that’s when to realise both the reason they seem effortless, and the positive effect they can have. I find it can work like a turbo at the end of a race too, when you think your body can’t deliver any more, but you realise you can beat that guy you’ve never beaten before a sudden adrenelin burst can be like an extra gear, pushing you beyond the limit. Through my experience in fitness training I have become pretty good at controlling my heart rate, and so can limit the rise caused by the adrenelin in situations where it’s not an asset to me. Try to assess what you perceive as your weaknesses, why they occur, and what you can do to utilise their effect to your advantage. Faster than planned, but still in the comfort zone most of the way. I know I’m coming into good shape when I have to consciously hold myself back in training from going too fast. The half marathon should be great on Saturday – there are three of us getting together to row it in my back garden, and one more joining us from New York on rowpro – you simply can’t do anything but your best when you’re doing the same challenge with quality athletes like this. On a recommendation of a friend I bought a bike GPS unit today, a Garmin Edge 305. It’s on charge at the moment so I won’t get to use it until later in the week. It has some great features for recording my cycling workouts, so should be useful. This training blog gets quite a few views, but very few comments. Please do comment if you have a question, find any of the information on here useful, or couldn’t find what you were looking for and have a suggestion for extra content. Thanks for reading. With one week to go before the end of phase 1 of Pete Plan 2008, and the half marathon test, today was a hard 60min piece. My aim was to row the majority at my half marathon pb pace, and speed up towards the end if I could to give me confidence of rowing the extra 15mins next weekend for a pb. This is certainly a season’s best for the 60mins, and I think probably my best for 2 to 3 years. Perhaps I should have pushed just a little harder to break 17k, but that wasn’t the objective today. I rowed exactly to plan keeping just under 1:46.6 for the first 50mins, then speeded up in the final 10mins to finish a good margin under target. With 4k (about 15mins) to go to complete a half marathon it is certainly on for the pb next weekend, but it won’t be easy! This afternoon I then took the opportunity of the only dry day this weekend to go on a training ride on my bike. Out and back to Basingstoke on the country roads through Fleet, Elvetham, Winchfield, Hook, 21miles on the way there, 19.5miles on the way back. With the wind mostly behind me on the way there I got some good speed up on the flat, and into the big ring. Even with 3 map stops along the way I averaged over 17mph for a 1min11 total time. On the way back I was joined by a fellow erging cyclist for the journey, but I was pretty tired by then, and the wind was against us, so it was slower going taking 1hr25 to get back. A great ride though, and a nice mixture of some small hills, some fast country lanes, a few miles of fast A road, and not too much traffic. I am ready for my rest day tomorrow now! And glad of the three day weekend. As well as Saturday’s 60min row, today’s row was a bit of a ‘make or break’ in terms of confidence. The initial plan was for a 12k starting at 60min pb pace and perhaps negative splitting if I felt up to it. I decided that was just too fast though, and with the half marathon the real focus of this training phase I switch to a 12k starting at half marathon pace (1:46.6) and negative splitting if I felt good. With no warm up before it took the first 10mins to warm up into it and for the rate to settle. I find that when I start on a longer hard piece like this I don’t need to warm up first as long as I lighten the stroke at the beginning by increasing the rate a little. I felt good at half way so I had in my mind to target 1:45.6 average pace, as that is the pace needed to break 17k in an hour. The target for this Saturday’s hard 60mins will again be to break HM pb pace of 1:46.6, but ideally breaking 17k would be great. I’m now only 10days away from the first big test of Pete Plan 2008, the half marathon. My confidence of doing a personal best time for that row in 10days time is actually pretty low at the moment as I simply don’t feel good and fast this week. Either I have a slight illness lingering in the back ground, or there is some residual fatigue from the cycling on Sunday. Perhaps it’s just one of those things, when training at quite a high level I think we all go through periods where training feels great and every performance is high, and effortless, then periods where each session is a struggle and seems to stretch on forever. As I’d not rested as normal on Sunday I decided to rest from the erg on Monday, and only cycled to and from work. On Tuesday I again cycled to and from work, and then entered a rowpro 5k in the evening. I wasn’t planning on doing a better 5k for this month’s CTC challenge, but I think I will try to fit one in very early next week if I can. Today I actually had time for a gym session at my preferred time of day, lunchtime. Just a steady 10k. Again I have set targets for the people I’m training with and not looked myself even which session I should be doing which day. Just a nice steady row as I’ve been feeling tired all week. On Saturday I have a tester session that could be make or break for confidence for the HM test the following weekend – a hard 60min row. For me this is 4/5 of the duration of a half marathon, so as long as I can complete it at half marathon pb pace it will give me confidence for the HM the following weekend. The idea really is to do it a bit faster than that, but even HM pb pace is 1:46.6, so that would be faster than I’ve rowed an hour for some time. Fingers crossed for a dry day on Saturday to do the row in the garden – anyone local care to join me? Failing that I could see if I can get some company on rowpro. I also have speed and altitude traces in excel for the entire route which make interesting viewing, and illustrate the hilly nature of the ride. Unfortunately excel files can’t be uploaded to the blog, but I will save them as jpegs and post them in an entry another day. If you’re interested in seeing any part of the route in more detail please reply and I’ll post any sections people are interested in. 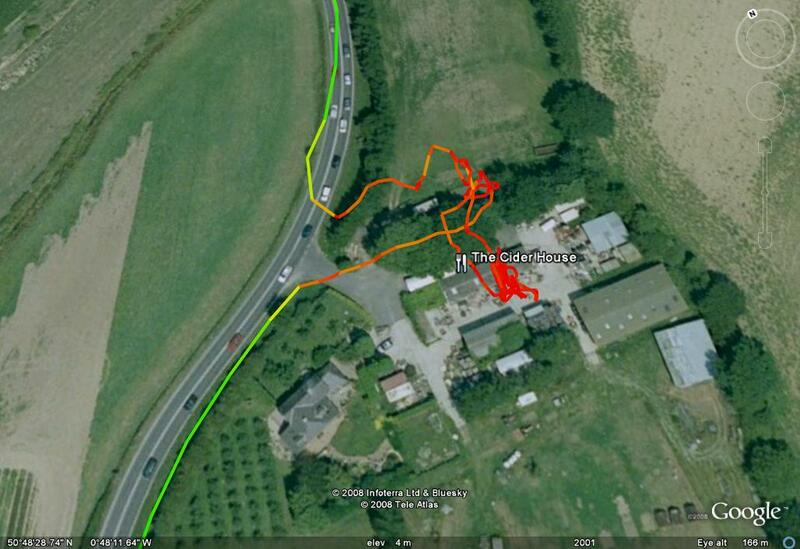 The route can also be colour coded by altitude or speed. After an ice cream on the beach we then cycled back to Chicester, which due to time had to complete our cycling for the day, and instead we caught the train back home. 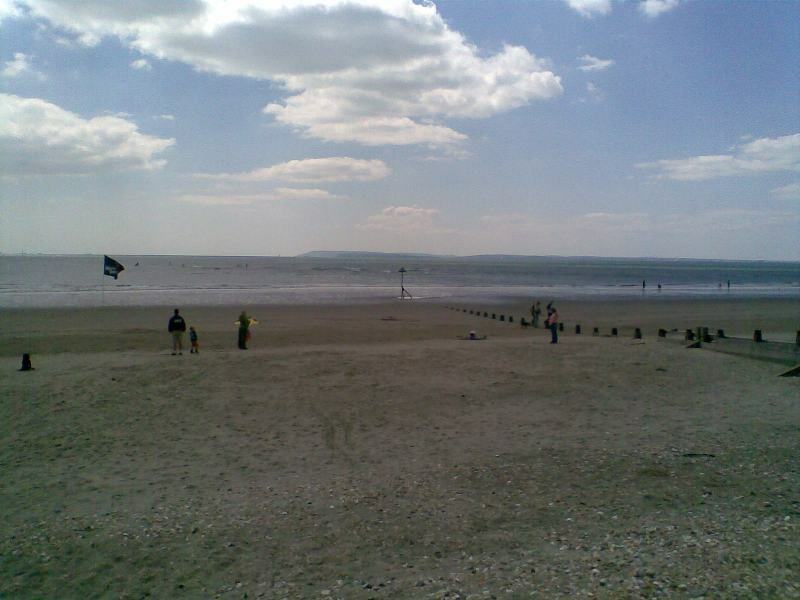 The route to West Wittering was 88km, with a bit over 2500m of ascent, with a further 14km or so to Chicester afterwards. Next time I do a similar ride I will be more selective in what I need to carry with me, and not take a 35litre rucksack on my back – I’m sure it contributed to the discomfort in my back during the middle of the ride. Some of the climbs were challenging, but we only had to walk up one section due to the gradient, and my gear troubles – I wasn’t able to select any of the bottom 6 gears without it skipping out of the gear if I stood on the pedals. I think I have adjusted the gears correctly now so this won’t happen again. As I’m not an experienced road cyclist I wasn’t prepared to go too fast down the hills – we hit a maximum speed of a little over 38mph, even though I was braking pretty hard at the time! 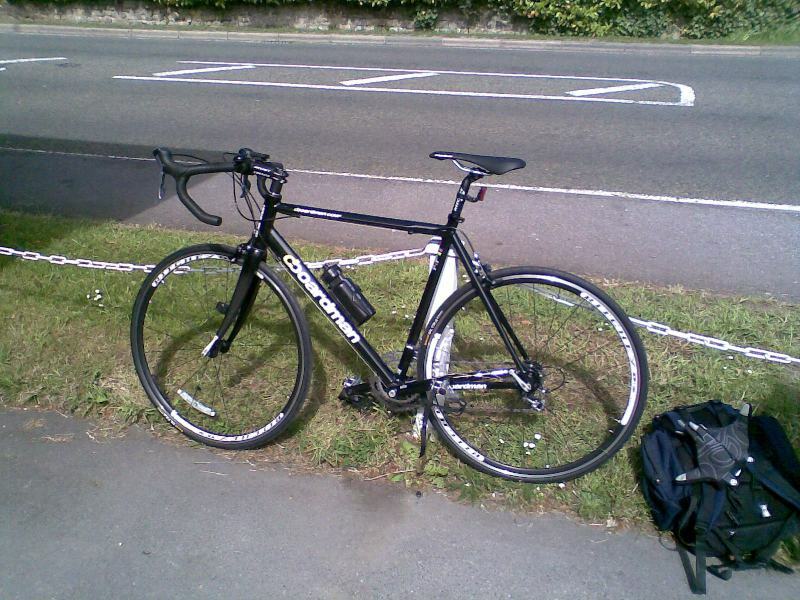 Other than that, my legs felt good throughout, and my rear I’m sure will get used to cycling! I often forget that I’m following a set training plan with a group of athletes when it comes to the day’s training. I set targets for all the people I coach over the weekend for the following week but, perhaps mistakenly, I never commit my own targets for the week to paper. I should start doing that. Luckily I remembered this morning to check my spreadsheet for what session I’d set other people, and that session was a negative splitted 60mins. The targets I’d given the others was split into 20min segments at half marathon +3 pace, half marathon +1 pace, and half marathon -1 pace. That makes it a tough hour physically, and a seriously tough hour mentally having to increase pace in steps like that. With the 5k and 10k session yesterday I wasn’t fully recovered for today, so I just went into the session aiming to get as close to the targets as possible. I set it up on rowpro so that with other people rowing too I wouldn’t be tempted to stop. As I said, I wasn’t feeling fully recovered for today’s session. That’s part of the reason for putting a hard distance session on a Saturday though – if you can do it after a hard week of training that fresh and rested you can do better when it comes to a test. Also doing it negative splitted you can go faster by sitting at the same average pace from the start. These are 2 vital factors because I’ll need to be averaging 2sec faster pace than this in 2 weeks time to pb the half marathon, and that will be 15mins longer on the erg. After the first 20mins at 1:50 I decided to step down in pace 1sec / 10min rather than 2sec per 20min. Then into the second half I revised this simply to beating the last 10min split for the last 20min. It was pretty tough, but an enjoyable row, or at least it felt like a solid accomplishment when I finished. 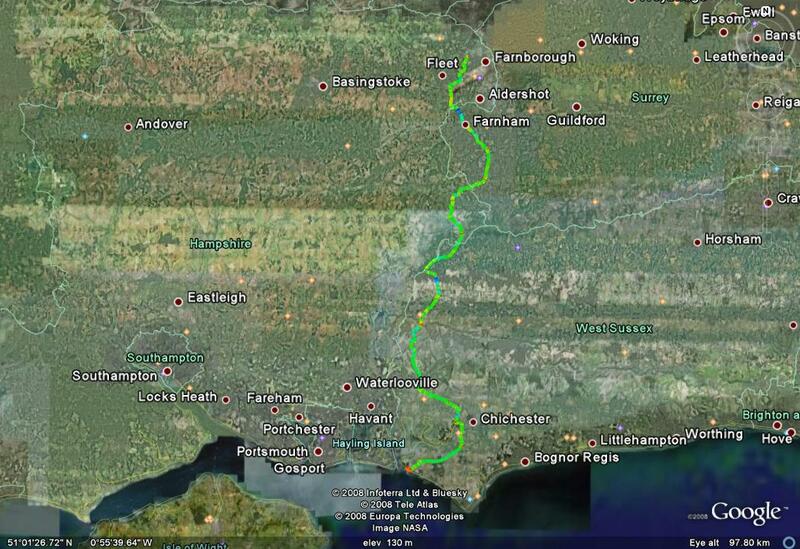 Tomorrow is a day off, and a planned long cycle ride down to the south coast. Unfortunately I can’t get the wireless bike computer to work on my new bike – I think the battery in the transmitter is dead, so I’ll need to get a new one to try before taking it back to the shop. Fingers crossed that’s all it is. Also fingers crossed it isn’t raining tomorrow. I didn’t think I would get a chance to train during the working day today, and wasn’t really looking forward to doing today’s planned session at home this evening. A 45min window opened up in the middle of the day though, just enough time to fit in a 5k CTC row. The desire to push hard left me at the half way point unfortunately, as evident from the splits, but still a solid row, and an improvement for the CTC. Getting the 5k out of the way at lunchtime allowed me the opportunity to enter the Friday evening 10k handicap row on rowpro. As before the start time was a 40min baseline with everyone handicapped on when they start from that. Last time I rowed off a 3min44 handicap, this time I took a 4min20 handicap. It was a great race tonight, and a very close finish – I just managed to take the lead within the final 50m of the race, and was pulling 1:30’s to do so. The pacing plan was 1:47’s, so absolutely spot on for the first half, and then gradual negative splits for the second half. As the entry titles says, this was due to the racing instinct that I just can’t leave behind. 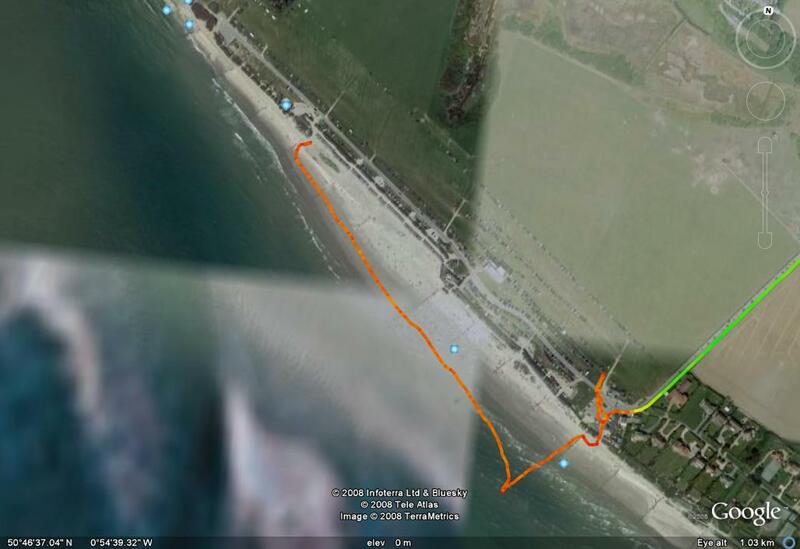 I was constantly watching the distance I was behind the leader, and how much it was reducing by every 100m. Then in the final 100m I was determined to pull fast enough to take the lead, but the other rower was obviously pretty determined to win too, so his 1:42’s meant I had to pull 1:30’s to catch him in time. It felt great. The second half of this row I just felt so strong and in control, a brilliant feeling. This is a great sign with the HM test just 2 weeks away, as I need to be rowing this pace for 21k then. To compliment the GT-R road bike we have on a turbo trainer at home I have now got an “outdoor” road bike. It’s awesome, and I will post a picture tomorrow. My first ride out on it will be on Sunday when I’ll be doing a leisurely ride down to the south coast – something like 50miles away I think. We will worry about getting back after we get there. I bought the bike boxed and built it myself last night, so hopefully I didn’t leave anything vital off….